Vivaldi potatoes had no claim to fame until a research institute published in 2006 that they were less fattening compared to other potatoes. The press, obsessed with weight, republished this story ad infinitum. At the same time it was claimed that Vivaldi have a naturally buttery taste so that butter lovers had no need to adorn their Vivaldi potatoes with a knob of butter. That was basically it as far as Vivaldi was concerned but the findings of the original claim were never put to the test further. Read on for an independent update! At GardenFocused we have no technical equipment to test the calories that a potato contains, but Sainsbury's (for example) do have access to that type of equipment. They also publish their findings online and on the packets of potatoes they sell. On their page about the nutritional details of Vivaldi potatoes, Sainsbury's show that Vivaldi salad potatoes contain 81 calories and 17.5g carbohydrates per 100g. Guess what! Charlotte new potatoes and Sainsbury's own brand Baby Potatoes contain exactly the same amount of calories and carbohydrates as Vivaldi. So, it would appear that Vivaldi potatoes are really much the same as other varieties in nutritional value. They are definitely no better for slimming than any other potato variety. The next claim, the buttery taste of Vivaldi potatoes, is a bit more difficult to track down to the original source. What is sure is that it has been repeated online and in newspaper articles many times. But just how many of the authors of those articles, we wonder, have actually compared the taste of a Vivaldi potato to the taste of a Charlotte potato, and to several others for that matter? Well we have! Vivaldi have a slightly smoother texture compared to many other varieties. But the buttery taste? Not a trace of it! That's our independent opinion and we have no axe to grind in favour of any particular potato variety. The parents of Vivaldi are TZ 77 148 and Monalisa, neither of which are commonly grown in the UK. A relatively modern variety of potato which was bred by HZPC. Their official page about this variety can be found here. Note that, contrary to some published sources, "Naturally Best Packing" did not breed the Vivaldi potato, they were wholesalers and promoters of the brand. They were also bought out by Albert Bartletts in late 2006. The world of potato wholesaling is full of interesting twists and turns! Nothing is quite what it seems. The potatoes have a pale yellow / brown skin colour with speckles of brown over the surface. There are very few eyes and those which do exists are very shallow. The shape is a reasonably regular oval one, size is medium to large and the expected yields are slightly above average. Vivaldi is a second early variety of potato but can equally be left in the ground and treated as a maincrop. This extends the cropping period to over a long period of time. When harvested as a second early the flesh is waxy, though noticeably less waxy than a first early. When harvested as a maincrop the flesh is far more floury. The plants grow to an average height producing lots of white flowers. Berries are only produced very rarely. Produces a good crop of potatoes which can be harvested over a longer than average period of time. Disease resistance is on the low side including susceptibility to foliage blight and eelworm, the two major problem areas for the average UK gardener. Rather average taste. Vivaldi has now become a relatively common variety of potato which is readily available online and sometimes in garden centres. Suttons Seeds (a GardenFocused approved supplier) sell Vivaldi seed potatoes which are not only correctly certified but they are graded by size to avoid unduly small seed potatoes being sold. Click here for more information and to buy this variety online. Their 1kg bag will contain approximately 11 good sized seed potatoes. Crocus also sell this variety online in 2 kg bags of carefully selected seed potatoes, click here if you prefer this supplier. The primary quality of Vivaldi is that it crops over a lengthy period of time producing reasonable quality new and old potatoes. There are several other varieties which more than give Vivaldi a run for its money. 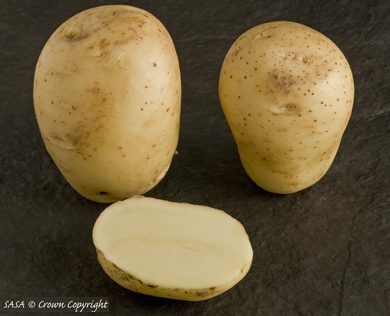 The first we would recommend is Nicola; when harvested as new potatoes they look just that little bit cleaner and in our opinion taste significantly better. They are also capable of growing into the maincrop stage when they still have the edge over Vivaldi. At both stages they boil better. Charlotte also tastes better, holds their shape better and they are often quoted in recipes as the potato of choice. Kestrel is also worthy of consideration as is Maris Peer which has good disease resistance. We recommend that you start chitting / sprouting Vivaldi potatoes in the third week of February. This will give them four to five weeks to develop healthy sprouts just at the time when they are ready to be planted out. Keep the potatoes in cool but light conditions to ensure they grow short, green sprouts. Click here for our page dedicated to chitting / sprouting potatoes in the UK and Ireland. Vivaldi potatoes are second earlies potatoes and they are ready for harvest, if conditions are correct, 15 to 17 weeks after the seed potatoes are planted. The key factor governing the time for planting all potatoes is the date of the last frost in your area. Even a touch of frost can damage potato plants if their foliage is above ground, an unexpected severe frost can kill them completely. The date for planting Vivaldi potato seed can be calculated on the basis that seed potatoes will take four weeks before they appear above ground. Given also that you want them to appear above ground only when the danger of frost has passed (the last week of April 2017 is the UK average) the last week of March is about right time to plant them. If you miss this date, planting them up to a month later will still result in an acceptable crop. This second early variety can be left in the ground longer than the normal 16 weeks and it will increase in size for four weeks or so, growing strongly. It will become more floury by the week, but it still makes a very good potato. The table below sets out how good or bad this variety is at resisting common pests and diseases in the UK. The 0 point is average with minus (red) values showing lower than average resistance and plus values (green) showing higher than average resistance. USE: Good for mash and chips / saute. When late harvested, good for baking. POTATO SIZE: Medium to large, variable.